The Converse Blog: The Converse Blog's Friday Flashback: Magic Johnson Triple Double, Energy Wave, a new poll, and quite possibly the longest title to a post yet! The Converse Blog's Friday Flashback: Magic Johnson Triple Double, Energy Wave, a new poll, and quite possibly the longest title to a post yet! Welcome to another exciting Friday Flashback. As you can see by the ridiculously long title today, this is going to be a packed post. Today's post is kind of exciting because it correlates to the new poll that I've posted. So for the next 5 Fridays I will be featuring shoes that have one of the 5 Converse technologies listed in the poll. Working my way from top to bottom, today I have Energy Wave. What is Energy Wave? Well, it was a synthetic foam used for energy return. Below are some thoughts on the technology. "According to our mathematical models, Energy Wave has a 17 percent performance advantage over EVA," says Rick Bunch, manager of the Converse company's biomechanics laboratory. He adds, "For a competitive runner, that can be a lot." From the article, "The race to make a 'perfect' shoe starts in the laboratory." On a side note, this article makes mention of a Puma shoe that had a computer chip in it, and then plug it into your computer for and get data from your run, and this was in 1989. Also I found this piece of information about Energy Wave. "Converse has developed its own midsole material called the Energy Wave which is 10 per cent lighter than compression-moulded EVA (an advance in itself). Converse claims that its new material gives 50 to 55 per cent energy return compared with 40 to 45 per cent for Gel and EVA and 25 to 30 per cent for Air and polyurethane. The company also claims a longer life for the Energy Wave shoe. After 40 kilometres, its says, EVA has lost 20 per cent of its cushioning compared with 0.5 per cent for Energy Wave. For many runners this durability may prove a better selling point than the energy a shoe promises to return." I found this in the article, " The race for a better running shoe: Some manufacturers claim that their shoes give 'energy return' to help you to run faster. Others say that their rivals are chasing an illusion." Which actually destroys my idea of a long title. So I didn't exactly pick a great shoe for Energy Wave day, simply because there is no visible Energy Wave in Magic's shoes. This one is on me, I am actually in Lexington today and not on my normal computer. So I didn't have as many pictures as normal and these were the best of any shoe with Energy Wave that I had. With that being said, these are still amazing. 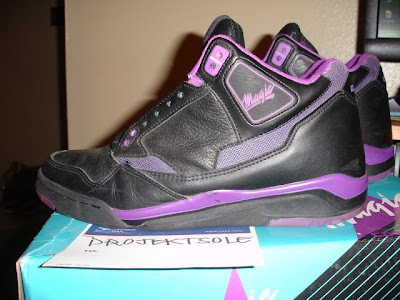 And before we get to them, big thanks to Project Sole from ebay for pics. Yes these are Converse, yes they are under the Magic brand. Long before Dwyane Wade, or even Dennis Rodman had their own Converse shoe and Converse apparel there was Magic. You don't hear much about the Magic line anymore, not since Magic left Converse and fired some shots at the company at the time. Which may or may not have been true. Of course this was way back in the early 90's and when Magic returned in all of his Ref attacking glory he did it wearing a brand called MVP. 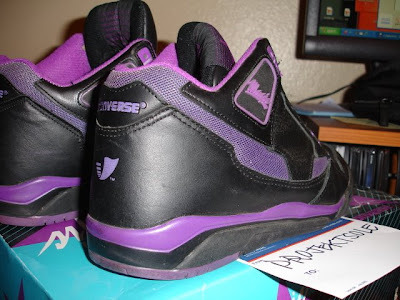 I would love to see these re-issued, but I am not sure of the likely hood of Converse and Magic working together again. I haven't heard one way or another, but I always felt like if it were ever going to happen it would be this year during the Converse Century. I still have my fingers crossed. This last shot is gives proof of the use of Energy Wave, that would be the Energy Wave logo towards the bottom of the heel. These technology was used in the ERX and Conquest lines of basketball shoes as well. I am not for sure, but I believe these were called the Triple Double, I have the white colorway for myself. Well I truly enjoyed today's Post and I hope you did as well. I can't wait to dive into the other technologies in the coming weeks. Thank you for stopping in and remember the vote in the new poll. With the money they have from Nike...Converse should reuse these tech they created for their shoes now. The main problem for Converse is no brand name shoe besides the Weapons. 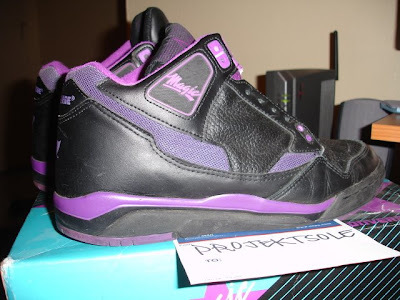 Nike has to many to count... Magic's shoe was created to please Ervin after he saw what Jordan was getting at Nike. does anybody know if these are worth anything? 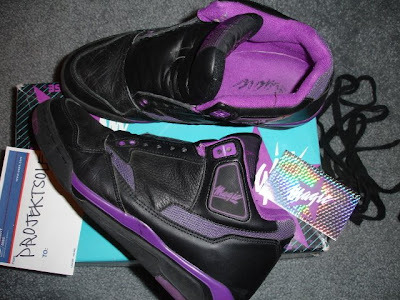 i have a pretty fresh pair of these in the white, purple, and gold color scheme that i am planning on selling.